Have a wedding coming up in the family or are you one of those Indian beauties who loves wearing sarees and can sport it with as much elan as you can the dress? Whatever be the case, you have to check out Savera Sarees for your shopping list. You will find this store on the same stretch of Park Street that has boutiques lining up every few steps. Almost close to Mullick Bazaar, Savera's collection of sarees will legit boggle your mind. A sprawling boutique divided into two sections, it has sarees taking up every inch of its space. Light, regular sarees to gorgeous party ones - they have plenty to keep you in the store for hours. The section in the front mostly stocks the regular kota, linen, khadi and light silk sarees. Go into the inner section of the store and you can check out the more exclusive collections. Savera's signature and unique collection that comes from its own mill is what makes the collection more standout. Their signature muslin and raw silk combination saree is a best seller and it's a must add to your closet. Available in a multitude of colours (lime yellow to slate grey), this one will give you the classy look that you can pass off with at any occasion. Another must check thing are Savera's jute sarees. We found them wrapped around at least a hundred reels in the store. 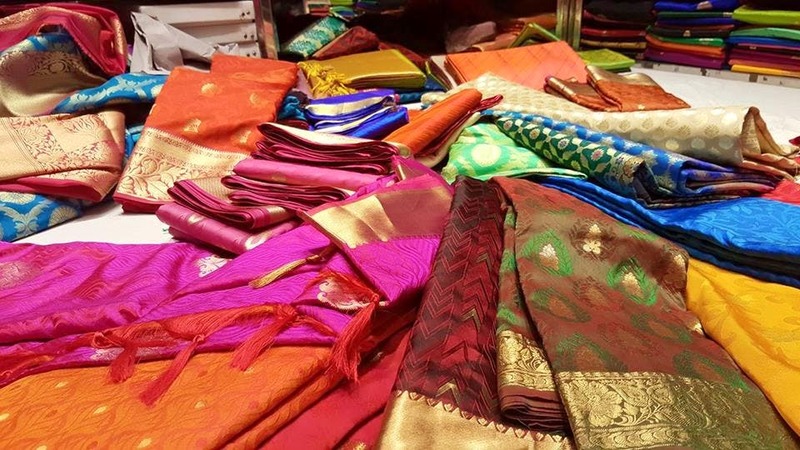 Heavy silks like uppada, kanjeevaram, Benarasi, tassar and others are also available. Best of all, the staff is really helpful, and they will give you enough time to check all the collection (and even drape the sarees) before you zero down on the ones you want to buy. Prices start at INR 2,700 and can go up ta a lac or more. They do not do home delivery of sarees that you have left in the store for fall and pekoe stitching. You will have to come and pick it up by yourself. If you request, they will even get your blouse and petticoat tailored for you!